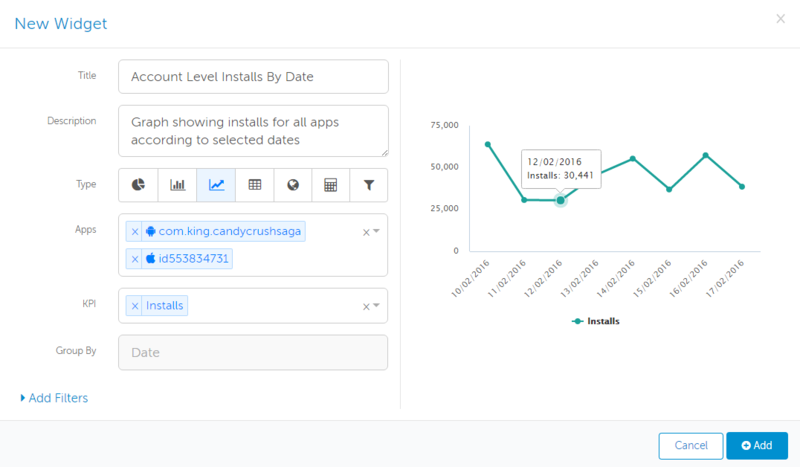 The Custom Dashboard allows you to build your own customized dashboards from inside the AppsFlyer dashboard. 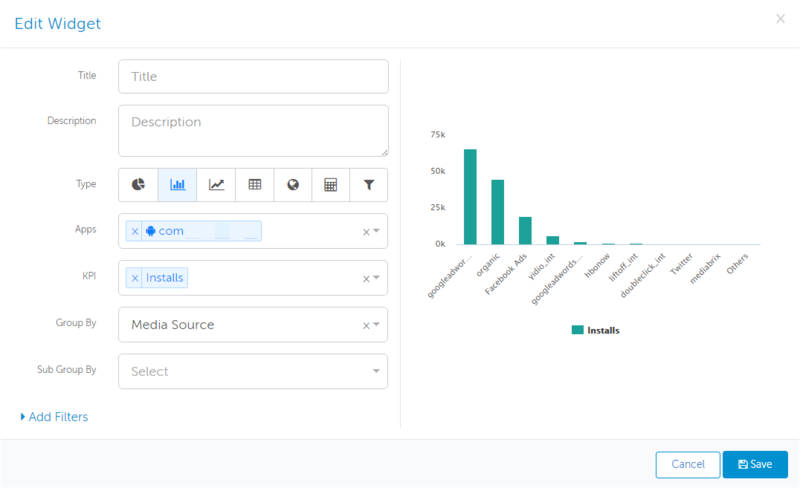 You can easily select, name and position the items that you want to view and have that data in your own customized report. Using this feature, you can create as many dashboards as you want to suit your needs. From the left-side toolbar of the dashboard under the Dashboard section, select Custom Dashboard. The New Dashboard window opens. In the Title field, enter a name for your new custom dashboard. In the next window click at the bottom of the screen. The New Widget window opens. Provide a title for the new widget. Enter a description of the widget - this appears in the dashboard. 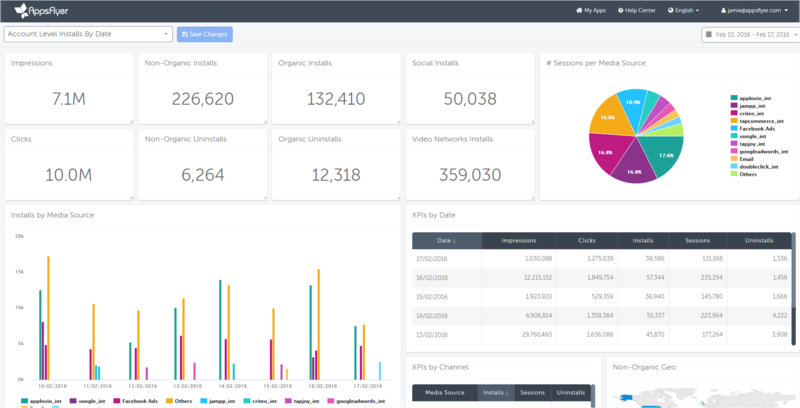 All KPIs on custom dashboards are LTV-based data, and are related to installs and in-app events from user acquisition campaigns, in parallel to the KPIs of the dashboard's Overview page. 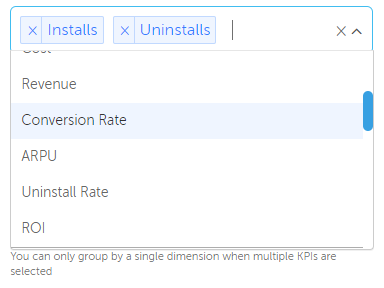 Therefore, currently custom dashboards KPIs don't include data from other dashboard pages likes retargeting, activity, retention etc. 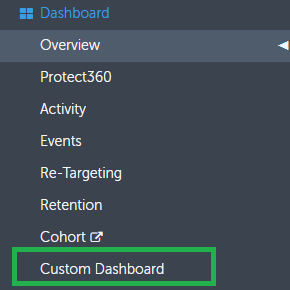 In the Custom Dashboard window, your new dashboard now appears in the dropdown list of existing custom dashboards, where it is available to all your team members to access. Another way to share your custom dashboard with your teammates so they can enter it directly, is by sending the custom dashboard's browser URL to them. Click on the name of the dashboard you want to view. If the widget isn't the right size for you, you can resize it by dragging the corner of the widget. Additionally, if you want to change the order and position of the widgets, simply using drag and drop, you can re-position the widgets to create your ideal dashboard. As you hover over each widget with your mouse, an arrow symbol appears and you can select what you want to do with that widget. 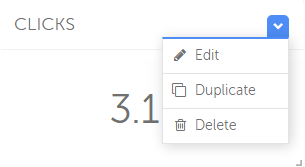 You can edit, duplicate or delete a widget. Custom dashboard displays the data in the same localization values, i.e. same time zone and/or currency as the apps. Custom dashboard displays the data in the default localization settings of UTC time zone and USD currency. You can also export any widget's data by hovering over the title, clicking on the Down Arrow icon, and selecting Export CSV. Note that the dates in the CSV file are in the international format of dd/mm/yyyy. If you wish to convert them to another format, e.g. mm/dd/yyyy, here's how you do it in Microsoft Excel.